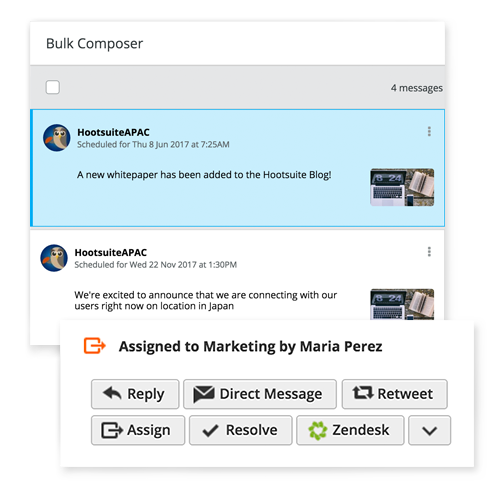 Whether you are a group of five or a team of one (and growing), the Hootsuite Team plan makes you even more productive. Be more effective in driving ROI for your business with social. The Hootsuite Business plan is used to manage and measure a large social media presence across multiple networks. Integrate social into your organization and transform your business into a truly digital one. Manage all of your company’s social networks in one convenient dashboard, and get a bird’s-eye view of what’s happening in your social world. 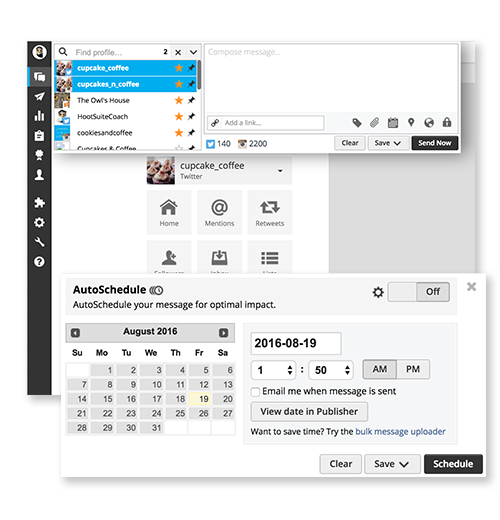 Schedule unlimited messages across all your social networks. Be a part of the conversation and never miss when people are talking about your brand. Track your social media campaigns so you can improve ROI and grow your business. Work as a team by assigning messages so they get to the right people in your business. Two-step authentification ensures your brand and social networks are protected. Track your brand, what customers are saying about you, and your competition. Ready to be more efficient on social? 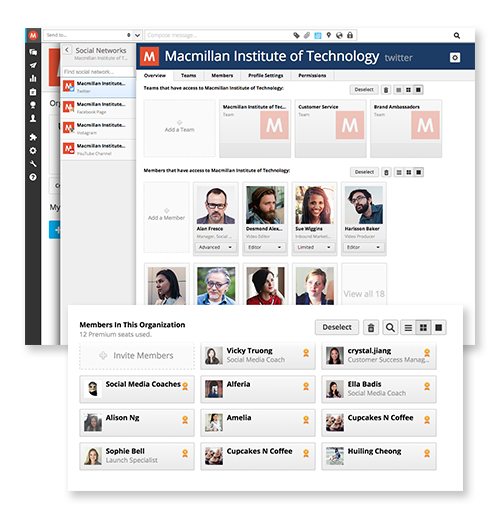 Put all your profiles in one place, schedule posts across multiple networks, and easily measure results. Put all your profiles in one place, schedule posts across multiple networks, and easily measure results. To me Hootsuite is a must have. To have a really integrated social media program does take a lot of effort, but a program like Hootsuite makes it more streamlined, more efficient. It is really an all-encompassing tool that gets you the information you need, and has the resources you need to get it done effectively. Manage multiple Facebook Pages. Share your workload with team members. See all activity in one place. With one secure dashboard, you’ll work fast and efficient. Quickly schedule content across Facebook, Instagram, LinkedIn, Twitter, YouTube, and more. Schedule a week’s worth of updates in one sitting. Or schedule a month-long Instagram campaign. Easily create keyword search streams to track brand mentions, respond to customers, and find new online leads via social. Hootsuite lets you monitor every conversation across your social networks, so you're always in-the-know. How will Hootsuite save you time? It’s simple to connect Facebook, Instagram, LinkedIn, Twitter, YouTube and more to Hootsuite. Now, you can schedule, monitor, and publish content across all your social accounts—from one dashboard. With all your social media accounts in one place, you can easily create insightful reports. With Hootsuite, you can. From scheduling to measuring, Hootsuite helps 10 million professionals get more done on social media.